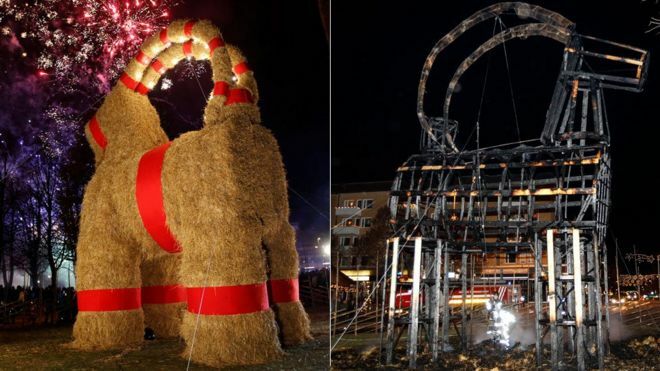 A giant Christmas goat effigy, erected each year in the Swedish town of Gavle and a favourite target of arsonists, failed to last 24 hours this year, BBC reports. The straw and wood structure was put up on Sunday, the first day of Advent, but was burnt down soon after despite extra security measures. Last year the famous goat survived until 27 December before arsonists set it alight. It is the 35th time in 50 years that the goat has been destroyed. This year the town reportedly spent 2.3m kronor (£200,000; $250,000) on constructing the goat and subsequent festivities. Closed-circuit TV had been set up to monitor the structure. Local council official Helene Akerlind told newspaper Gefle Dagblad (in Swedish). : "We'll have more guards. We're going to try to have a 'goat guarantee' the first weekend." But despite Gavle's best efforts, The Local reports, an arsonist managed to get past a security guard who had briefly left to use the toilet. The police launched a preliminary investigation but there were no immediate arrests. The "Gavlebocken" went on Twitter hours after the fire to say it hoped for better luck next year.